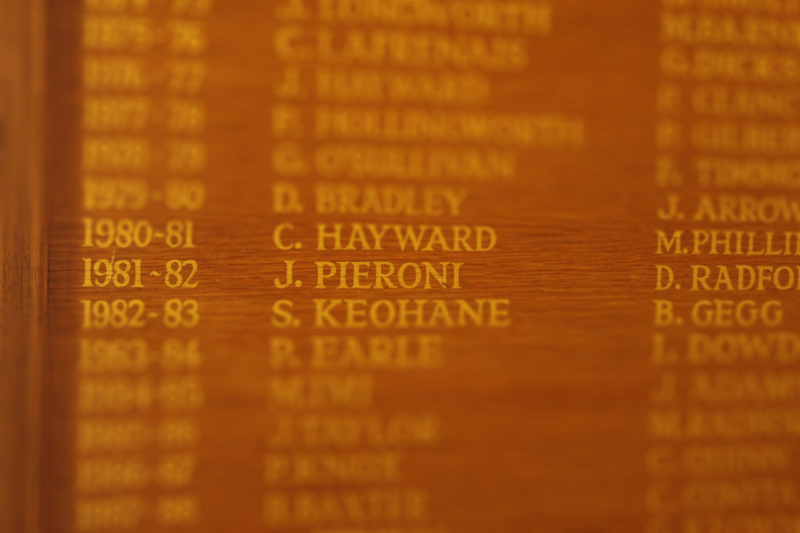 On Friday 11th March 1983, John Pieroni, ex-head boy and captain of the 1st XV rugby, died whilst undergoing a minor eye operation at Kingston Hospital. 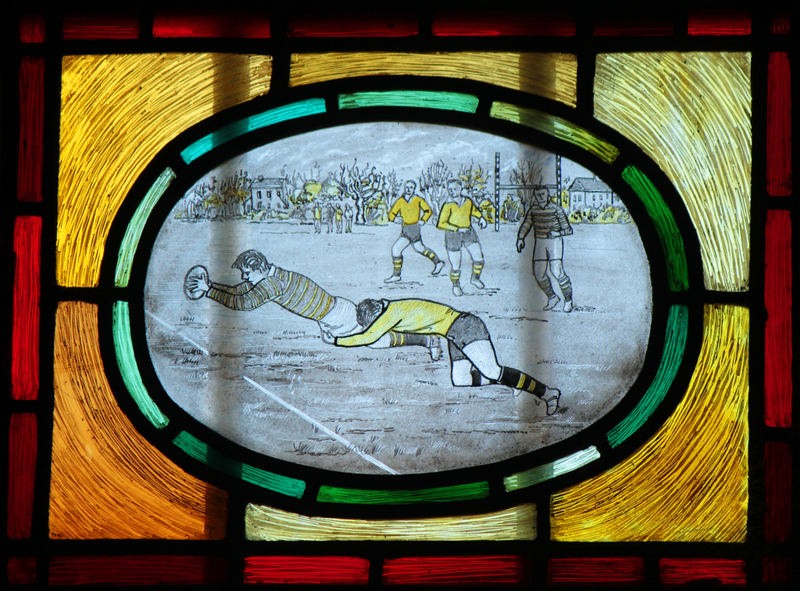 A rugby tournament in his honour has been played annually ever since. A few words spoken by Mr A Poole at the Mass in memory of John Pieroni at the Sacred Heart Church, Wimbledon on 17th March 1983, with the entire College present. “All of us who knew John well will carry with us the memories and impressions for the rest of our lives. On an occasion such as this I can only share with you something of the impression which he created in me. Although he enjoyed much of his academic work, he would have been the first to admit that he was not a brilliant scholar; what he achieved, he achieved through hard work and diligent application. In Syntax he gained a good solid crop of O-Level passes. When I asked him, on his entry to the Sixth Form, why he had chosen Latin as one of his A-Level subjects, his answer typified his whole approach: “I think it will be a good challenge”. He faced that challenge squarely and with determination. I remember him in the office on that day last August when the A-level results arrived and, again typically, he had gained the highest accolade an achieved two A grade at A-level out of his three subjects. None of you who saw him play rugby for the 1st XV, whether as a team member for two seasons, or as Captain last year, could doubt that he played with total commitment and enjoyment, or that he inspired the rest of the team to follow where his courage led him. He was the first to congratulate others on their achievements; his demeanour on and off the ruby field was always impeccable. I will remember the comment of one of the rugby coaches last year, that it was remarkable (now that John Pieroni had taken over the team) that they actually sang carols and Welsh hymns after matches on the way home – and with gusto; not for John the falseness of a macho image. That team would do anything for him. Some of you now in Grammar who went on the Irish Tour last year will confirm he was approachable, sympathetic and always concerned for others. Again I find it typical that as I understand it, having scored against King’s in the previous two seasons, he dearly wanted to make it a hat-trick this year – but he did not attempt to gratify that whim until the game was as good as won – and then he scored. There was not an ounce of selfishness in him. He lived his short life to the full and with tremendous zest. He played 1st XI soccer, 1st XI Cricket, and ran for the cross-country 1st VIII. He played in a blues band and was a scout instructor. I shall long remember the force with which he spoke in the Debating Society – not loudly, but with a passion and conviction which held his audience. He was a born leader because he had the courage of his convictions and took on responsibility despite his genuine doubts in his ability to do so. He had a fierce pride in his College and in its reputation at large. It is no exaggeration to say that the respect in which he was held, by staff and boys alike, is unparalleled in my experience. John was, of course, originally intending to go on the rugby tour to Canada this Easter. I often pose the question to Sixth Formers in R.E. classes – “What would you do over the next 48 hours if you knew for certain that you were going to die at the end of that time? How would you behave? The answer, if you think about it, is that you should be able to act just as you would do normally. The day before he went into hospital, by then uncertain whether the doctors would allow him to go on the tour, John typically did a sponsored swim in the College pool for the other members of the party – and equally typically he had already collected the money beforehand. 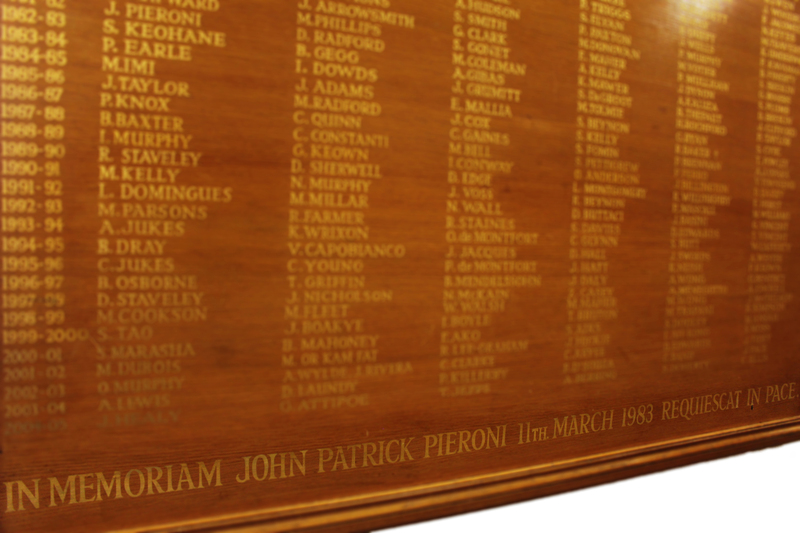 The Honours Board at Wimbledon College was inaugerated as a memorial in John Pieroni's name.